Petite USB drives, already handy for carrying data, are getting smarter: New technology from a company called U3 allows a drive to store and, when plugged into any PC, securely run applications--without leaving a trace of data on the host computer. The applications (which must be U3-compliant), data, and personal settings all reside on the portable drive, permitting you to temporarily turn any Windows 2000 or XP system into a personal workstation without threat to your privacy. 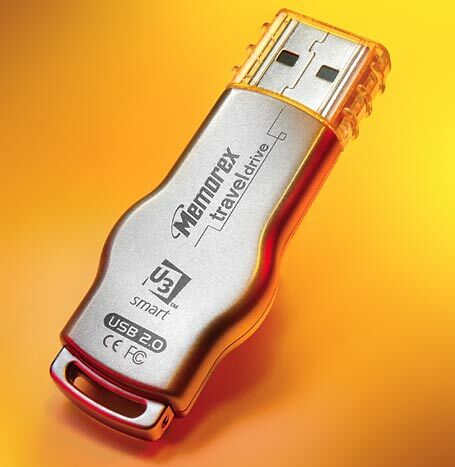 Memorex's U3 Traveldrive looks like a standard USB drive, but can store and run apps. We tried out one of the first U3 drives, a 256MB preproduction Memorex TravelDrive that came preloaded with Migo desktop-syncing software, the Mozilla Thunderbird e-mail client, and a U3 version of McAfee VirusScan. When we plugged the drive into an available USB port, two new drive letters appeared in My Computer: one for a standard USB drive, and another, labeled U3 System, that functioned like a virtual CD-ROM, allowing U3 programs to launch automatically the way that apps on a CD do. A U3 icon appeared in the system tray, as well; clicking the icon launched the U3 desktop menu, which looks vaguely reminiscent of the Windows XP Start menu, displaying a list of the available applications in one column and several utilities for exploring and managing the drive in the other. In the lower-left corner, a Download Programs icon links to the U3 Software Central site, where you can browse and download additional software. When you're done, you click an eject button on the menu to safely remove the device (although if no apps on the drive are open and you aren't copying any data onto the drive, you should be able to simply unplug it without problems). As promised, the drive left no traces of the applications on our test PC, apart from the device number that any USB drive leaves in the Windows Registry when plugged in. The use of USB drives for portable applications isn't brand new. M-Systems XKey drives, for example, let you carry Outlook with you and--when you plug your drive into an Internet-connected PC--synchronize data with a corporate Exchange server. But until now, such functionality was based on proprietary technology. U3, which was formed by M-Systems and SanDisk, will license its computing platform to any developer that wants to distribute an application on a U3-compliant drive. At press time, several dozen companies had either released or announced U3 versions of their software, including America Online, ArcSoft, Cerulean Studios (maker of the Trillian universal instant messaging client), McAfee, Nullsoft (developer of the WinAmp digital audio software), and Skype. In addition to M-Systems and SanDisk, about a half dozen vendors, including Kingston Technology, Memorex, and Verbatim, have announced U3 drives. "Running applications from the USB drive means, in essence, your entire computer productivity can be handled strictly from the thumb drive itself," says veteran technology consultant Tim Bajarin, who predicts that by the beginning of 2007 more than half of USB drives will ship with bundled software. A drive's capacity will, of course, limit its ability to hold applications and data. Most of the first U3 devices being released are 512MB or 1GB models priced between $42 and $100; currently only Memorex offers 256MB ($30) and 2GB ($180) drives. Software bundles vary: In addition to Migo, Thunderbird, and VirusScan, the first U3 apps include PreClick's PhotoBack image editor, Skype's VoIP software, and the USafe password protector. U3 CEO Kate Purmal says the technology was designed so that it could conceivably be used on other portable storage devices such as CompactFlash or SD cards. She says U3 is negotiating licenses with more than 30 hardware and software vendors. "From the consumers we questioned, the most frequently requested programs they would like to see are secure browsing, e-mail, and financial programs such as Quicken and QuickBooks," she says.